any idea what that might mean ? Almost got it. After you merge the 2 parts together, XSI still keeps the original parts, so you need to delete the mic and head, keeping the merged version. I used the schematic view to see how the parts are connected, then deleted the original parts and parented the merged part. However, one thing I couldn't figure out is how to set the centerpoint for the merged part, I ran out of time. Tomorrow, I won't have time to play around with XSI. Maybe this info will help you a bit more. what is a center point xD I thought i saw an option saying something about a center point ... I'll give it another go today . From the error message, it seems you still have something extra in your model. The centerpoint is where the part will rotate around. If you click on different parts of the body, you will see the xyz icon appear where you can move or drag the part. The location of the xyz icon is the centerpoint. If you still have problems, post the model and I'll look at it on Monday. I'm sorry, but, I just cannot figure out XSI tools and how to solve the problems you are having. When you merged the parts, what setting did you use for: Inputs construction mode, I selected Modeling. Don't know if that will make a difference. Further, I can't find the way to set the centerpoint or pivot point for a body part. We need to know how to do that, if we bring in non-Oni parts. 3D modeling is really my weakest point when it comes to modding. EdT thanks for trying and for the effort u put really appreciate it ... hopefully one day we'll figure it out .. I'll keep trying ... maybe not for this particular project but for a future one . and I hope 1 day I'll be as good of a modder as u are. EdT is this white hair growing software free? Or must you pay it? Is it difficult to learn? How old are you anyway? I always thought of you as a old man but im not sure. XSI's free, as mentioned twice on the previous page And all respectable 3D modeling apps are hard to learn. They're complex programs. 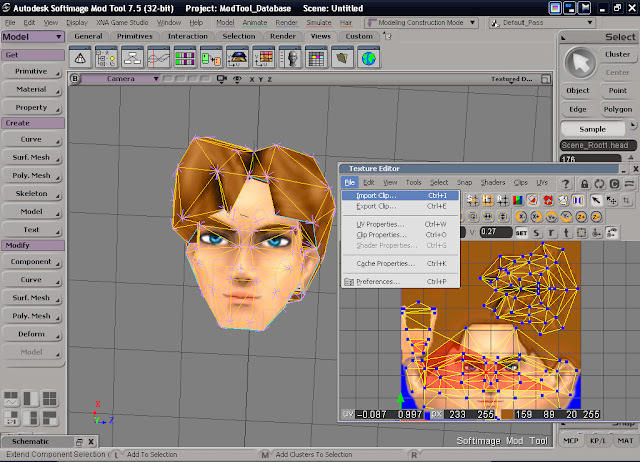 The problem appears to be the materials part of the head. Hopefully you saved your work as a scene, the dae info is not enough. If you press 8, you will get the explorer window, as you look through the body parts, when you get to the head, you will see that it has a lot more data associated with it, compared to the other parts. That's causing the error in OniSplit. How to fix it? I don't know at the moment. But at least made some progress in the investigation to the problem. how come u guys need to discuss a tool like this? Dosent it come with a handy book ? Merge parts and export work around tutorial. Before you merge any parts take note of the location of the centerpoint of the original part, you will need to set the merged part to the same setting. To see the centerpoint, click on the original object then press V. you will see the xyz icon at the centerpoint. Select the parts you want to merge. Under Materials, UV's header. select Merge. Then under Inputs header click Delete. This removes the original parts. Rename the merged part to the name of the original. Now click on the merged part and press the V key. You see the xyz icon appear, this is the current location of the centerpoint for the merged part. Click on CENTER on the SELECT Panel, then press V to access the move icon, then move the centerpoint to the correct location. Click on CENTER again to set the pivot. Using the CONSTRAIN Panel, click on the PARENT button to set the parent child relationship of the the merged part. Finally, in the EDIT panel, click on the FREEZE button. This will clear the modeling history. Export the model as FBX (File/Crosswalk/Export FBX) In the dialog box, unselect the Cameras, Lights and Animation options. 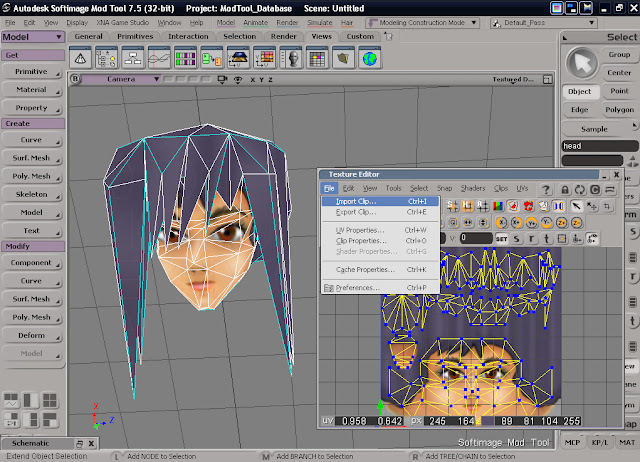 Convert the FBX file to DAE using FBXConverter. Now you convert the DAE to .oni format with OniSplit. 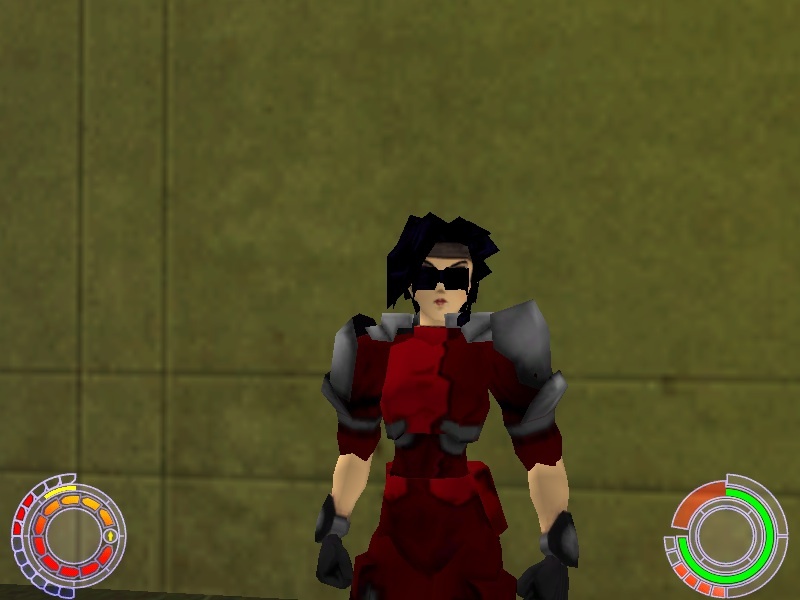 Here is a quick example of taking the googles and mic from the Comguy and putting in on the Fury's head. Of course, the TXMP needs to be adjusted of the googles and mic, which I did not. look at the texture map ... Probably the new mesh will have overlapped parts which will make it difficult to texture later ... in my case the microphone and the back of the head overlapped so if I made the hair blond the mic will have the same texture . here u can see the red parts on Casey's face in the texture map which represent overlapping . what about a tutorial ....just making a basic head shape ? Just use an existing head, it's 100x easier. none of us I think has built a head from scratch in XSI so don't expect a tutorial on that ... what u can do like Iritscen said is modify an existing head .. for example Casey uses Karen's ( female cop) head, BGI agent's head is a combination of scientist - com guy - kerr - and even striker ... after some modification it looks really good i think ^_^ so don't complicate urself start with the basics . dream996: In my first post there is a link to a video tutorial on how to make a robot soldier. Modifying an unwrapped model is probably easier than using the default animation state. Here's how to unwrap the model. Note: You can export an unwrapped model as DAE. OniSplit will read the DAE and set all the rotations of an unwrapped model back to 0 before importing to Oni. 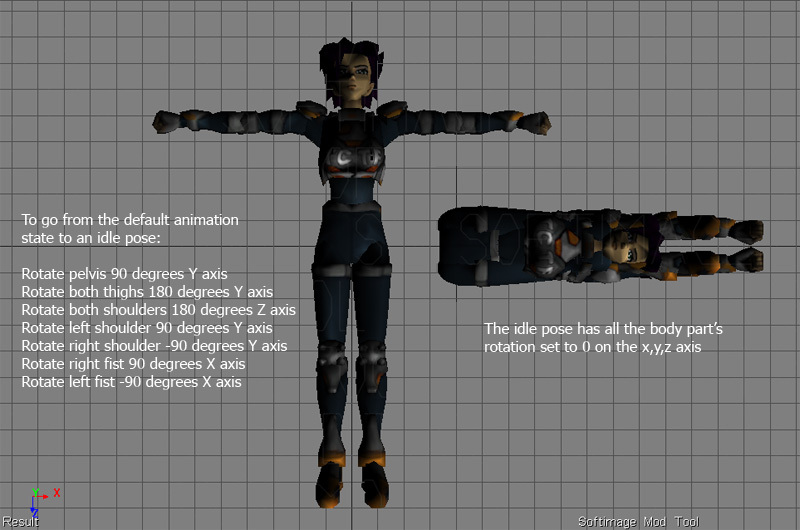 Remember, the default animation state with all the body part's rotation set to 0 (zero) on the x,y,z axis is how the Oni game engine expects the data for the character to be. So if you are creating a new model from scratch, you will need to get all the body parts aligned in the default animation state so it to be imported correctly. I'm not clear on one point though, after I use the rotate on the parts ... should I "freeze rotation" so they are set to 0 or will OniSpli handle that ? also ... how do u make the textures show up on the whole model at the same time ? .. I haven't been able to figure that out on my own I just found out how to preview them on 1 part at a time as I wrote in my previous post. Samoko: If you are rotating the parts just to view them (or modify them) in an unwrapped pose, then you should not freeze the rotation. The only time you would freeze the rotation (set the rotation to 0 on all the axis) is when the part is in the proper default animation state. I exported the ONCC for Konoko as DAE, and that gave me the DAE and the textures. XSI imported the DAE with the textures, so then I changed the view mode from wireframe to textured. If you exported the TRBS for Konoko, then no textures are included.